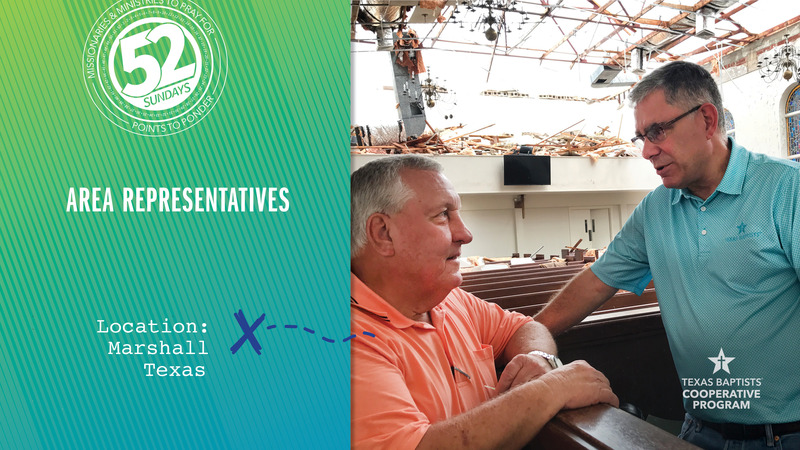 Area Representatives are the boots on the ground for Texas Baptists. They spend the majority of their time on the road, driving to various churches in their regions, and responding to needs each day. Tim Watson, area representative director, focuses on the Longview area where he has 550 churches in his region. The nine area representatives have over 250 years of combined pastoral experience. They often serve as interim pastors at various churches. They also offer pastors informal counseling and guidance and connect them with Texas Baptists training events, specialists and resources. Area Representatives are supported by our church’s gifts through the Cooperative Program. Let’s pray for our nine area representatives as they meet the needs of churches around the state.